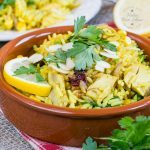 This leftover roast turkey biryani is a quick, quick easy and delicious one pot meal for all the family to enjoy after Christmas or Thanksgiving to use up the leftover roast turkey. Recipe includes instructions for Instant Pot or Electric Pressure Cooker as well as detailed notes on ingredient substitutions and additions as well as WeightWatchers Points. Preheat the oven to 180C / 350F / GM4. Add the garlic and spices and cook for a further few minutes until the onion is soft. Remove from the heat. Stir in the turkey, rice, peas and corn into the onions and spices. Pour the stock over. Cook in the oven for 25 minutes or until the rice has absorbed the stock. Stir through the cranberry sauce and spinach and add a little water if the rice is slightly chalky to bite. Return to the oven for a further 5 minutes. Serve immediately with a squeeze of lemon. Add the rice and an equal volume of stock stir in the turkey, and set the Instant Pot to cook on high pressure for three minutes. Let the pressure release naturally for eighteen minutes with the keep warm setting. Add in the defrosted peas and corn, with the spinach and cranberry sauce, stir, replace the lid and leave on warm for 5 minutes. This is a very forgiving dish providing you get the rice to liquid ratio right. Rice – We’ve tested this with both basmati and long grain rice (shown in the photos). It is far better with basmati rice which has that lovely fragrance. If you use long grain rice you will need to cook in the oven for about another 5 minutes. Use Leftover Roast Chicken, Pork or Lamb – We used leftover roast turkey, you can equally well use leftover roast chicken, pork or lamb. No Leftover Roast Meat? – If you are using fresh, raw meat then cut into chunks and fry along with the onion at the start of cooking. Make it Vegetarian or Vegan – leave out the meat and add a can of rinsed chickpeas or other beans and use vegetable stock. No Cranberry Sauce? Add mango or other chutney in its place. Add more vegetables – This leftover roast turkey is the perfect dish for adding extra veg to. Add chopped leftover roast vegetables (potatoes, parsnip and carrots work well), stir in florets of cauliflower and broccoli 5 minutes before the end of the cooking time or substitute any leafy green for the spinach. Garnishes – Again use what you have, I love fresh coriander (cilantro) but and fresh herbs are delicious. Garnish with toasted flaked almonds, cashews or pine nuts for some texture and crunch. Oven cooking time will be about 25 minutes for basmati rice when you add boiling hot stock, or bring the pot to a simmer before you put it in the oven. With different types of rice or cold stock allow another 5-15 minutes. I’d check after 25 minutes and then adjust the extra cooking time. This recipe has 14 Weight Watchers SmartPoints per serving.